Meeting held on Thursday, 07 March 2019 from 6:00 p.m. to 7:30 p.m. at the home of Lori Stafford. Chuck Rader thanked all division members who were able to attend the American Red Cross Shelter Fundamentals classroom training conducted on Thursday, 28 February 2019 at the Pisani training portable. Jim Mollerus, the ARC instructor for the class, is looking for approximately four Saratoga CERT Shelter Fundamentals class graduates who are willing to step forward for the additional curriculum training and leadership responsibilities associated with becoming a credentialed ARC Shelter Supervisor. The additional on-line American Red Cross training required for becoming an ARC Shelter Supervisor is approximately six hours in duration. An American Red Cross-mentored Shelter Simulation exercise for Saratoga CERT members who have completed the Shelter Fundamentals course, originally scheduled for 30 March 2019 at the City of Saratoga Pisani Community Room, shall be rescheduled to a later date to afford time to widely advertise this event, and ensure that we have enough shelter “general duty” volunteer workers and trained Shelter Supervisors present for the simulation exercise. Peter Melhus spoke about lessons learned from the City of Saratoga SARA/ARES/CERT ham radio/FRS radio communications exercise held on Saturday morning, 23 February 2019. A number of ham’s participated, but CERT FRS radio participation was fairly limited. Jeff Walker provided amateur radio coverage for the simulated Cox Command Post at Kevin Moran Park. Tom Baker, Chuck Rader, Brad Silveria, and Kevin Marques provided field FRS radio check-in’s and simulated post-disaster reports. It was proposed by Peter Melhus that the Cox CERT Division should hold a monthly all-division FRS radio “roll-call” check-in comm exercise on the firstMonday of every month at 7:30 p.m.On a rotational basis, one divisional member will function as the Cox Command Post net controller positioned at Kevin Moran Park. This individual will initiate the exercise and note who has called in with their specific location and time of transmission. The first divisional FRS radio comm exercise will be held on Monday, 01 April 2019. One of the next upcoming key training opportunities will be on Thursday, 25 April 2019, when Michael Grodin from the Campbell CERT organization (and a Santa Clara County Emergency Medical Services EMT in his daily work) will provide “Stop the Bleed” training. There will be two back-to-back training sessions on this evening; the first from 5:30 p.m. to 7:00 p.m. and the second from 7:10 p.m. to 8:40 p.m. The training will be conducted at the Pisani Recreation portable. An Eventbrite sign-up webpage is in the works, and its ETA is Wednesday, 13 March. The first session of focused training on key elements of the Cox CERT Division Emergency Operations Plan (EOP) was presented by Chuck Rader. 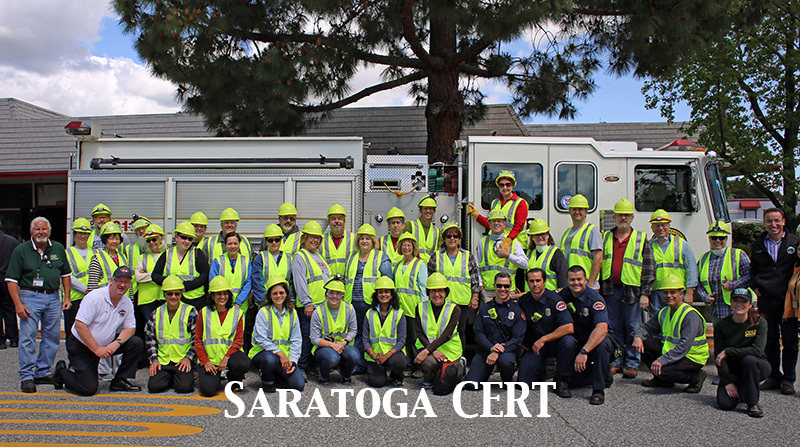 Topics covered in this training module included: The Disaster Service Worker – Volunteer (DSW-V) program as administered by the State of California Governor’s Office of Emergency Services; “Good Samaritan” laws associated with being a credentialed DSW-V; and Activation of City of Saratoga CERT members. Training from this first module will be continued at the next divisional meeting. Chuck Rader to research the role the Santa Clara County Office of the Medical Examiner-Coroner and federal DMORT resources have in addressing the deceased after a major-magnitude earthquake. Chuck Rader to research the possibility of using Church of the Ascension Catholic Church and Congregation Beth David Jewish Synagogue as inclement weatherCERT medical treatment sites. Chuck Rader to pursue discussions with the City of Saratoga on establishing a “subset” cache of immediate response CERT materials and equipment on the grounds of Kevin Moran Park. Thursday, 04 April 2019, from 6:00 p.m. to approximately 7:45 p.m.